Can you believe it's already 2010? I can't! I just wanted to wish everyone a Happy New Year!!! I don't have a new recipe to post today. It's not really a "resolution" post either, but I do have some plans for this year. Obviously the biggie will be adding a new baby to the family in April! But I also plan on crossing off some of the items on my Learn to Do List this year, and hopefully I can add some more items to it as I think of them. And this pretty much has nothing to do with cooking, but I'm planning on participating in Project 365, where you document your day to day life by taking one picture every day. A little more info can be found here (or tons of places if you do a search for it!). Anyway, this really intrigued me and I'd like to do it. I don't plan on posting pictures every day, only once a week at most or maybe even just once a month. I may just post the pictures here on this blog...I'm not that sure I want to start a completely different blog for this project, but who knows, I may! I hope everyone has an absolutely wonderful 2010!! The recipe calls for ham hocks, which in my ill-fated trips to the store on Monday (remember the forgotten cream cheese...) neither store I went to had ham hocks. It tends to be hit or miss with finding them. I guess I should buy extra and freeze them... The ham steak I had in the refrigerator was two days past its "use by" date, and with the stomach issues I've had recently, I just didn't want to risk it. So, I used some smoked beef sausage instead. I really like it with the ham hocks, but D preferred it with the sausage, and suggested I permanently change my recipe!! I found the original recipe on an internet recipe site, but it was credited to Emeril Lagasse. I was able to locate a similar recipe on the Food Network site here. 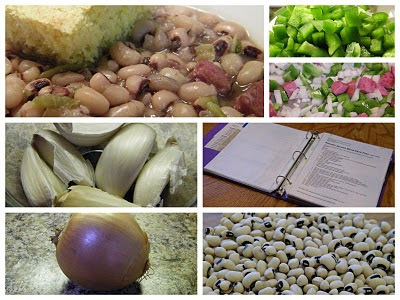 Serve with a big chunk of cornbread, and it's a quite tasty tradition indeed! Here's to a happy, healthy and wonderful 2010 my friends!! With a sharp knife, score the fat on the ham hocks 1/4 inch deep. Heat the vegetable oil in a large heavy stockpot over medium-high heat. Add the tasso and cook, stirring often, until heated through, about 3 minutes. Add the onions and bell peppers, and cook until softened, 4-5 minutes. Add the ham hocks, garlic, salt, pepper, cayenne, and bay leaves. Cook 2 minutes, stirring often so the garlic doesn't burn. Add the black eyed pease and chicken stock. Bring to a boil over high heat. Reduce heat to medium-low and simmer uncovered until the peas are tender, about 45 minutes to 1 hour. Remove the bay leaves and discard. Cut the meat from the hock, discarding the skin and bones. Return meat to the pot, stir in the parsley and serve.